Ooty Honeymoon Packages from Ooty Planet a division of Holidays DNA: We all want to make our honeymoon the most romantic and memorable vacation of our lives. Isn’t it? A good honeymoon is a perfect way to start your new life. Which place can be more romantic and soothing than the hill station of Ooty for honeymoon? Along with good destination, couples also look for hassle free vacation. The best to go for it is by opting for Ooty honeymoon packages. An appropriate honeymoon tour packages suiting one’s needs and budget is as important as selecting a destination of your choice. Honeymoon packages for Ooty cater to each and every couple with wide range of interests and preferences. Although there are umpteen numbers of Ooty honeymoon packages are available, one needs to be sure of the service provider which can ensure a good and applicable package. Ooty Planet which is a division of Holidays DNA promises a hassle free honeymoon to all its clients. Newly wedded coupled can choose from the various kinds of Ooty honeymoon packages available with us. With us by your side, accessing various facilities and getting information on the destination becomes much easier. We at Ooty Planet offer packages catering to, various kinds of requirements, different duration of trips and budget of the couples. We offer not only the best of honeymoon packages but also ensure that our clients get best possible deals and discounts. Along with all this, we assist or clients at each and every step and answer every query and clear every doubt in the best and most detailed way possible. Information regarding all the aspect the hill station is provided such as best time to visit, best places to see, commuting within the hill station and souvenirs to take home as well as share experiences and recommendation of others. Ooty honeymoon packages by Planet Ooty includes wide range of options on resorts and hotels, trip to popular tourist spots, choices on transportation modes )airway, railways and roadways) and booking of the tickets, etc. We also offer customized Ooty honeymoon packages taking care of honeymooners’ specific needs and requirements. Couples can be sure of getting detailed and updated information on the destination from Holidays DNA. Honeymooners will have enough of romantic settings and secluded time to spend with each other on their Ooty tour. However, to spend some quality time with your loved one, it is important to select the right kind of honeymoon package suiting both of you. 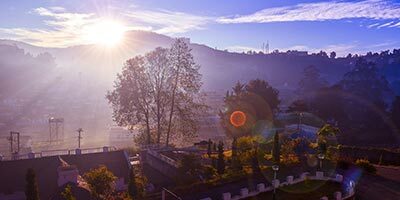 Located at an altitude of 2286 m in the Nilgiri District in the state of Tamil Nadu, Ooty offers mesmerising sightseeing options apart from tea gardens and exciting spots such as trekking, hang gliding, angling that includes Goad Trout, Carp and mixed water. Some of these are such as Dolphin's Nose, Hidden Valley, Ketty, Wellington's Golf Course, Sim's Park, Lamb's Rock, Law's Falls, Second World War Memorial Pillar, in Bellikal, places like Kalhatti Falls, Bison Valley, Bellikkal Lake, etc.